A vintage metal wash stand that has been retrofitted to hold two galvanized basins as sinks. Clever. Clever. 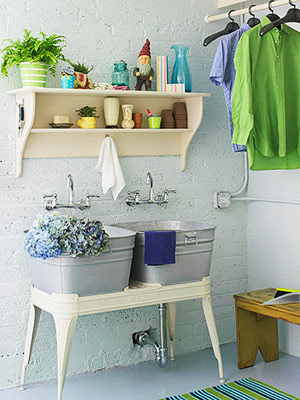 Now maybe someday when I have a real laundry room again, I can use this idea. I have my high school reunion coming up this year. I have 20 pounds to lose... yes 2-0. Sigh. That's what having 4 kids in 7 years will do to you. Actually, I was able to lose all that baby weight after each of the first three...it's just been this last time...and Mr. Three is almost 3 years old. Needless to say, something must be done. So, my dear readers, I hope you'll indulge me, as I check in with you now and then, and let you know how I am progressing. I need someone (or, in this case, many someones) to be accountable to besides myself. I start on my points system today! Wish me luck!! And finally, don't forget the FRUGAL FRIDAY LINKY PARTY!! Can't wait to see all the Frugal OCD (Obsessively Consumed with Decorating) goodness you come up with this time! Love that laundry room! With 4 kids, mine never looks that clean! :) Ah the 20 year reunion. I had mine last Summer...it was so much fun to see people. I was so nervous! I had weight to lose too....you can do it! The points does work so well. I'm there again, wanting to drop 10. Lets encourage each other along! My baby #3 has been my hardest to lose. He'll be 4 this summer. If you have an iPhone, there is a great app called Lose It! It's free and tracks your calories and exercise. I've lost 5 pounds so far but have friends that have lost 20+ just by looking at the food they eat. Good luck! I saw that same photo in my mil's magazine and instantly handed it the husband!! I have a double wash stand in my laundry room as my hamper...I *love* it..shabby, little bit rusted, galvanized goodness!! ahhhh seeing that photo has me smiling... soooo cute and I know just where i would put that darling sink idea!! I have my 10 year reunion this summer and I'm a little nervous about it too! I'm gonna be having my second baby only about a month and a half before the reunion and I don't know if I want to put my "formerly pregnant self" on display quite yet! I love, love, love the colors in this picture! I also love the sinks, very creative. Love love the washstand idea. And I can identify with you. My 20th is this year too and I'm right there with you on the 20lbs. to lose. Good luck! Love that wash basin idea! Very clever indeed! I have a highschool reunion this year too--and it happens to be about a month after I'll have my third baby--how fun! So much for looking grrrreat! Hopefully I'll be able to find something flattering to wear--maybe a parchute or a tent. :) We'll see. P.S.-I love your site, and stop by every day! Thanks for all of the inspiration and encouragenent! My weight with #3 was harder to loose too - I did end up losing it though using the point system, so I know you can do it! I used the food log at fatsecret.com - it made keeping track of points super easy. Good luck! I just signed up to do a half marathon. I've never run more than 5 miles...so I don't know what I was thinking! Good luck...I'm sure you'll make progress. I'm great at exercising but lousy at the eating. sigh. Love sweets too much! come join me at the gym..i'm there 5 days a week!